Swansea City caretaker manager Alan Curtis praised his side's spirit after they beat West Brom to climb out of the Premier League relegation zone. The Boxing Day 1-0 win was the Swans' first since 24 October and only their second in 14 league matches. "We showed fantastic character," said Curtis, who has been in charge since Garry Monk was sacked on 9 December. "We said before the game, as much as we want to maintain our style, we have to find a way to win as well." Former Wales forward Curtis added: "I think we can play better and we have played better in the last couple of games but we showed a different side to our game. "We were under the cosh and sometimes it was not very pretty, a little bit un-Swansea-like, but we showed enough to get over the line and get the three points, which I think we deserved." 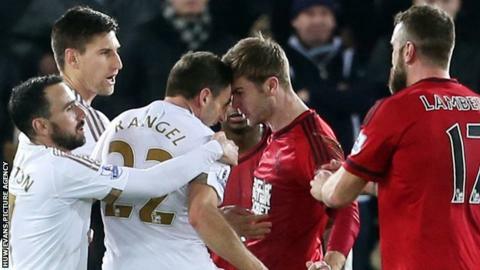 Swansea's run of one win in 13 Premier League matches had seen them fall into the bottom three. But Ki Sung-yueng's winner against West Brom saw them climb up to 16th place in the table. Next for Curtis' men in the busy festive period is a trip to Crystal Palace on Monday and an away fixture against Manchester United on Saturday, 2 January. "Psychologically, we're out of the bottom three. It's somewhere we've not been for a long time," said Curtis. "From a confidence point of view, it's bound to give the players a huge lift. "But as I told them [the players], we've got another big game on Monday and it's important - not just on Monday - we've got to carry this on. "The fight and the spirit [is there]. When the confidence picks up, we will get a bit more confident on the ball and I'm sure the results will follow." Saturday's victory came in Curtis' third game in charge, following a defeat at Manchester City and a draw against West Ham. Swansea chairman Huw Jenkins is still searching for a permanent successor to Monk and, while he does so, Curtis is happy to stay at the helm. "I keep going as long as the club tells me so," he added. "If the new manager comes in then so be it. It's important they bring the right person in. "If we can get a couple of victories or pick up points, it probably gives us a bit more breathing space."